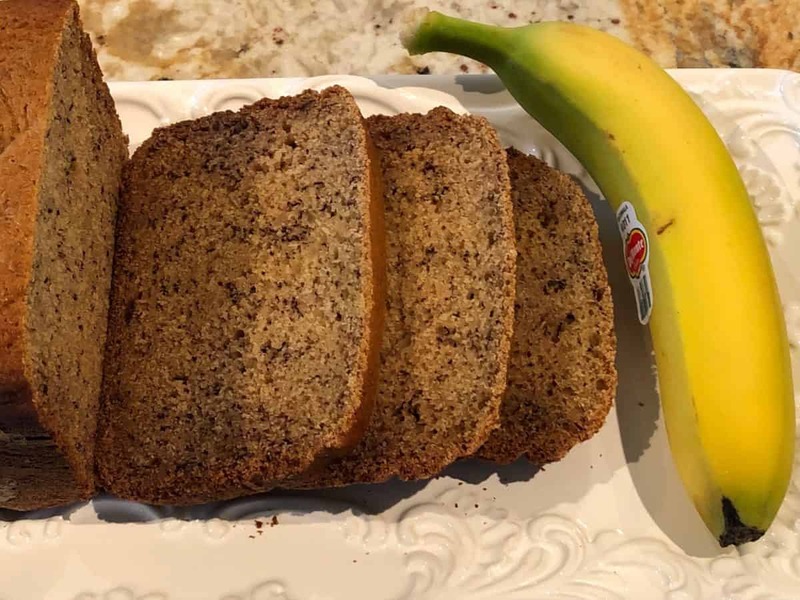 This bread machine banana bread recipe helps you to easily create a delicious banana bread… just like Grandma’s! Also since you are using a bread machine, you will be doing a ton less work than Grandma did when she made her banana bread. The key to great banana bread is… ripe bananas!!! If you use bananas that are hard & yellow or even worse green, they will contain too much starch and not enough natural sugars. As bananas ripen, they convert this starch into sugar. According to Wikipedia, “The greener, less ripe bananas contain higher levels of starch and, consequently, have a “starchier” taste. On the other hand, yellow bananas taste sweeter due to higher sugar concentrations”. FYI – You will know if a banana is ripe when it shows some small brown spots on the yellow exterior of the banana. Once you have mastered how to make some good bread machine banana bread, you can experiment by adding other ingredients such as raisins, blueberries, cranberries, chocolate, walnuts, etc. Listed below are some other great banana bread recipes that your family will love! 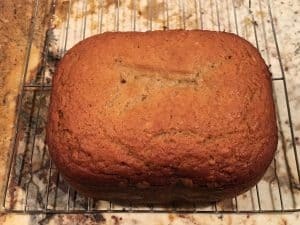 Since this banana bread recipe is done in a bread machine, it is simple & easy to make. It should take you only 10 minutes or so to prepare and then you let the bread machine do the rest of the work. For more great recipes, please visit Bread Dad’s main Bread Machine Recipes section. Bread Dad also has a printable and “pin-able” recipe at the bottom of the page. Soften the butter in microwave. Mix the water and instant nonfat milk powder together. Pour this instant milk into the bread pan and then add the other ingredients. Try to follow order of the ingredients listed above so that liquid ingredients are placed in the bread pan first and the dry ingredients second. Start the machine going after checking the settings. When the bread machine has finished baking the bread, remove the bread loaf pan and place it on a wooden cutting board. Let the bread stay within the bread loaf container for 10 minutes before you remove it from the bread loaf container. Use oven mitts when removing the bread machine container (bread loaf pan) because it will be very hot! After removing the bread from the bread loaf pan, place the bread on a cooling rack. Use oven mitts when removing the bread. Don’t forget to remove the mixing paddle if it is stuck in the bread. Use oven mitts as the mixing paddle could be hot. You should allow the banana bread to complete cool before cutting. This can take up to 2 hours. Otherwise, the banana bread will break (crumble) more easily when cut. Try to use medium sized bananas. The use of 3 large bananas can make the mixture too wet. We use aluminum free baking powder in our bread machine banana bread recipes. Read the label of your baking powder because some brands may use ingredients such as sodium aluminum sulfate. Making your own bread allows you to screen out unwanted chemicals. If you use unripe green or hard yellow bananas, your banana bread might not be as tasty. Unripe bananas have more starch and less sugar than ripe bananas. The natural sweetness of ripe bananas works best for bread machine banana bread recipes. Make sure to gently scrape sides of bread loaf pan with rubber spatula after first kneading and before second kneading. This will help to mix all of the ingredients. It will also help to prevent flour sticking to the side of the bread when it is finished baking. Use a rubber or silicon spatula in order to avoid damaging the interior of the bread loaf pan. Do not use a hard spatula (i.e. metal spatula). You need to leave the bread in the bread loaf container for 10 minutes after you take it out of the bread machine. Denser quick breads take a little longer for the interior dough to be fully baked. Since you are letting the banana bread “harden” for 10 minutes in the bread loaf pan, the mixing paddle might rip more of the bottom when removed (versus removing it immediately after baking). If the center of the bread top looks moist, try the “toothpick test”. Gently push a toothpick into the top of the bread and see if any dough sticks to the toothpick. If dough (batter) is sticking to the toothpick then it hasn’t completely cooked. Place the bread loaf pan back into the still warm bread machine for another 5-10 minutes. Make sure to wear oven gloves because the bread pan and bread machine will still be hot. After the 5-10 minutes, remove the bread pan and test the banana bread again with a tooth pick. Be careful when removing the banana bread from the bread loaf pan. Banana breads are much softer than sandwich-type bread loaves. Therefore, they can break or “dent” more easily when you remove them from the bread loaf pan. When removing the bread, you should be careful not to let the handle of the bread pan damage the bread. How do you know if a banana is ripe? 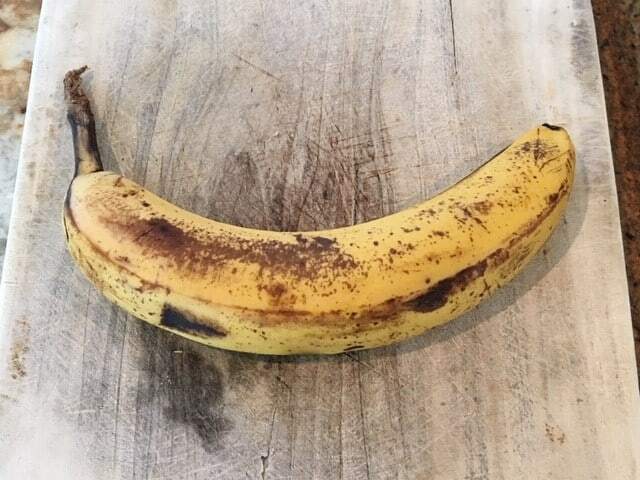 A ripe banana is yellow with some small brown spots. Hard bananas that are unblemished yellow or green have not fully ripened yet. Unripe bananas will contain too much starch and not enough natural sugars. What is the difference between ripe and unripe bananas? A ripe banana has converted much of its starch into natural sugars. It is much sweeter than starchy unripe bananas. Homemade banana bread will last only 1 or 2 days on the counter (and it will spoil even faster in a hot & humid environment). After baking and when the banana bread is completely cooled, you can store it on the counter in a large resealable plastic bag or an airtight container. You can also place a paper towel around the bread in order to absorb any extra moisture. For long-term storage, you should freeze the banana bread. It should be completely wrapped in plastic wrap or aluminum foil and then placed in a resealable plastic bag. Place the wrapped banana bread in the freezer and it should last for several months. Luckily, our bread machine banana bread recipe is so delicious, it is likely to be completely eaten within a day. Storage problem solved! This bread machine banana bread recipe helps you to easily create a delicious banana bread... just like Grandma's! Also since you are using a bread machine, you will be doing a ton less work than Grandma did when she made her banana bread. Loved Grandma’s banana bread but it takes too long to make from scratch? 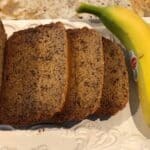 Then try our easy bread machine banana bread recipe. Simple & easy to make! Thanks for the easy banana bread recipe. It was delicious!